On Thursday, March 23 at 7 p.m. the University of Rhode Island’s Persian Cultural Society hosted Nowruz, a celebration of the Persian New Year, as a response to the devastation many Iranian students were faced with after receiving news that they could not return home for the holiday. Following the Trump Administration’s Executive Order on Foreign National Entry into the United States, many international graduate students that attend and work for URI were severely impacted by the unconstitutional travel ban. These graduate students are able to return home, but they may not re-enter the United States regardless of visa status as a result of the Executive Order—making it impossible for our Iranian community to celebrate Norwuz at home with their families and loved ones. Norwuz is globally celebrated amongst Iranian and Turkish people, marking the first day of the first month in the Iranian calendar. Typically observed on March21, the holiday directly aligns with the Spring Equinox. Previously, the University has not held a celebration for the Persian New Year. Planning came into effect two weeks prior to the event with support from Graduate Assistants United. Danielle Dirocco, the Executive Director of Graduate Assistants United, explains that the interest expressed for organizing Norwuz came directly from members of the Iranian student body that acknowledged the upcoming holiday and wished to do something as a community to celebrate. “When Trump’s Executive Immigration Order came down the first thing we, as a unit, did was look around and say ‘does this impact any of our people?’and looking around we realized we have a substantial amount of students that were directly impacted,” Dirocco emphasized. 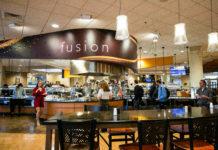 “We put an email out to our union members—graduate assistants, specifically—with a statement saying we fully support our international graduate students, and if this is negatively impacting you please reach out to us, we would love to give voice to the issues that you are experiencing and express empathetic and sincere concern,” explained Dirocco. 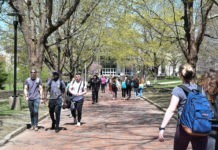 After the email, Graduate Assistants United heard from a number of different graduate students, with a generally warm reception. “As we were leaving, an Iranian graduate student came up to me saying ‘we have a holiday coming up, it’s two weeks from now, can we do something? And can GAU help?’ and we got to work putting together Norwuz,” explained Dirocco. The event garnered a large turn out; extending to audiences beyond those that annually celebrated the Persian New Year. 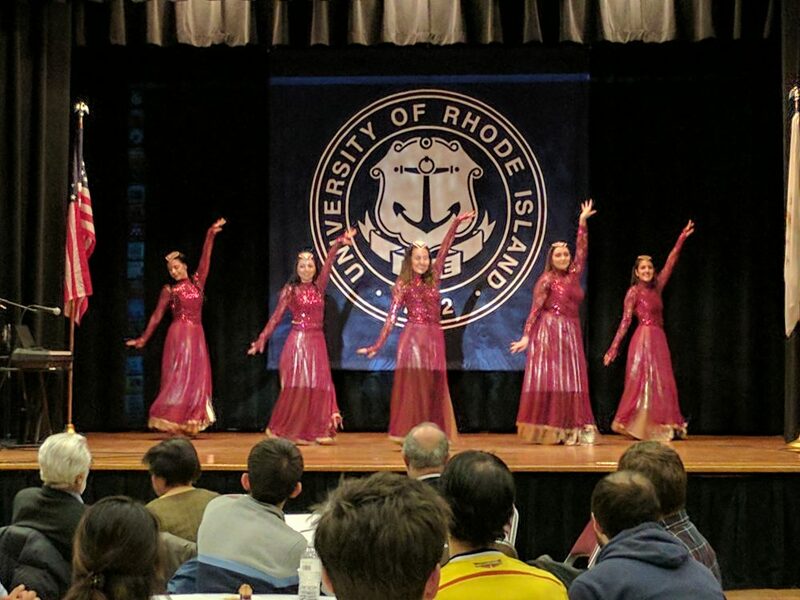 Festivities included a keynote address from Professor Ebrahimpour, a traditional music performance, a poetry reading from Brown University Professor Anvar, a pop and folk music performance, a trivia game about Iran, a traditional dance performance, a halal meal and a dance party. “The event was a huge success andIhopewegettodoitformany years to come. And if in two weeks we turned around an event like that, could you imagine what it would be like if we had nine months to plan? I am so excited,” Dirocco said. Remaining authentic was one of the main priorities. Upon entering there were tables laid out that demonstrated Iranian culture, images, and art. One of the tables on display is actually a part of the Norwuz celebration. Haft-Seen is the tradition of adorning a table with “seven S” items. These items include: sabzeh—wheat, barley, or lentil sprouts growing in a dish to symbolize rebirth; samanu— sweet pudding symbolizing affluence; senjed—dried Persian olives symbolizing love; seer—garlic symbolizing health and medicine; seeb—apple symbolizing beauty; somaq—sumac fruit symbolizing the color of a sunrise; and serkeh— vinegar symbolizing old-age and patience. The University’s celebration came at a very pivotal moment for this community “following the Executive Order there were a lot of tears and a lot of very real conversations,” explained Dirocco. One of the largest takeaways from this impressively successful event was that our community should be celebrating multiculturalism and inclusiveness, according to Dirocco. In addition, Dirocco reminds our student body in times like this that it is important that you don’t forget this is happening.